This entry was posted on October 19, 2012, in Media, Tactics and tagged emails, media, petition, rally, supporters, target. Bookmark the permalink. Supporters are gathering around your campaign. They’ve signed your petition and numbers are growing. So, how can you use your supporters effectively? What will make your campaign move forward? Your strategy is your overarching plan for your campaign (how you’re going to win), tactics are all the about the specific methods you will use along the way to maintain pressure on your target and enable you to achieve your goal. A campaign based on strategy without tactics means the strategy has no means of being carried out. Likewise, a campaign with tactics but no strategy is ineffective. A great campaign will incoporate a range of tactics, from the tried and true, to those more innovative and ‘outside the box’. Below is a list of some typical and not so typical campaign tactics. These are just some ideas that you might like to consider – try not to limit yourself to the suggestions below. Sending emails or letters to the target of a campaign or a decision-making body is an almost universally used tactic. It’s a great way to demonstrate support for an issue and putting the pressure on. You can make it easy for your supporters to take action by giving them a pro forma email/letter to send, but it will probably be more effective to encourage personalised communications by giving your supporters talking points and ask them to compose their own messages. That way, the person or group receiving the messages hears many individual perspectives on the same issue. Also, don’t forget the power of the more traditional letter which can be used in the same way as an email. Like emails and letters, calling particular people can a be a great way to directly engage with your target. To make it less overwhelming to your supporters (phoning a stranger can be intimidating!) you might like to give them a series of talking points, which they can use to organise their conversation. Encourage supporters to meet with their local representative or chapter of the target group – their local MP, the manager of their local franchise etc. Like calling a person you do not know, going to a meeting can be an intimidating experience so try to provide your supporters with as much information as possible about what to expect and say. Always suggest they call first to set up a meeting and be aware that it often takes a few follow up calls to get a date locked in with someone in a position of power (an MP, CEO etc). A petition should always be delivered to the target. The trick is making the delivery newsworthy or an event for supporters. Ask that your supporters come with you. Take a photo. Invite local media. Give speeches. The success of your delivery not only depends on you handing over your signatures, but informing your supporters of how it went – always send them an email afterwards explaining how it went (and include a photo to make it real!). Delivery can also be a chance to do something creative with your signatures and to make your petition stand out. 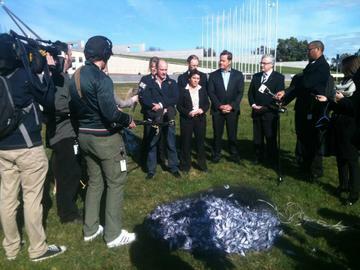 For example, as a part of the ‘Stop the Super Trawler’ campaign (created on CommunityRun in mid-2012) over 35,000 paper fish were delivered to the Federal Parliament House and released from a net on the front lawns. Each fish represented one of the signatories of the campaign. Something as simple as setting up a stall can be a great way to garner support offline and a fantastic opportunity to take your campaign directly to your community. If you are struggling to build a base of supporters online at first, then this can be an opportunity to begin the growth of your campaign. Think about what your campaign relates to and where the best places for you to set up would be. This is especially relevant for local issues where you can have conversations with those directly impacted by the campaign. Ask a couple of friends to join you in spending a few hours on the stall on a weekend, collecting email signatures and informing people about the issue. You might like to have information about your campaign, fliers, posters etc. After you’ve collected their information, these supporters can be folded into your online campaign and you can keep in touch with them via email like all your other supporters. 1) Go to your CommunityRun campaign management area and click on “Collect Signatures on Paper”. 2) On the page that you are taken to, click on the “Printable Blank Form” button. This will download an empty form that you can print out and use to collect signatures. 3) When you have finished collecting signatures, go back to your CommunityRun campaign mangement page and click on “Collect Signatures on Paper” again. This time, you should then click on the “Enter Petition Signatures” button on the page that appears. 4) Enter the information you collected into the dialogue box that appears. Historically, rallies have been important moments in many social movements. From the Vietnam War Moratoriums in the 1970s to community group marches down local thoroghfares, rallies can be a great indication of the group support behind an issue at critical moments in a campaign. In short, rallies are mass gatherings in public spaces. Usually they also go beyond supporters coming together and incorporate an event (e.g. a series of speeches) or a march. Rallies can be a really great way to draw attention to a delivery, or a particularly crucial moment in the campaign. Try to think of activities or decorations that will make your rally stand out – is there something that makes your issue unique? The following photo was taken as a part of the campaign to Save the ANU School of Music. It’s a great example of people coming together around an issue in a way that’s appropriate to the campaign – participants marched behind a marching band and the rally ended in a concert. It’s important to share photos like these with your supporters after the event to remind them of what your campaign is about and keep those who weren’t able to attend in the loop. Rallies are large group actions and take a lot to organise. It may be worth waiting to organise a rally until your campaign has many supporters and you have a team able to help put it together. Keep in mind laws around gathering and make sure you have the appropriate approvals. Like all campaign actions, the timing of your rally is also important. Is there a final decision on your issue or deadline that your rally could preceed? Great moments will give your rally a sense of “this is important right now”, and you’ll more easily be able to convert the energy of the rally into energy for your movement. A good example of a well timed rally was that held by the Australian Youth Climate Coalition in Adelaide during September 2012. The rally was held in support of plans to build a Concentrated Solar Thermal plant in Port Augusta and coincided with the end of a 100+ person walk from Port Augusta to Adelaide (~300km), also in support of the plant. With state and federal discussions on the issue to be held in the near future, the rally had a clear purpose at the time it happened and capitalised on all the energy around the campaign. A vigil is a more symbolic and peaceful form of protest. It usually involves people gathering to acknowledge the significance of a recent moment and is an opportunity for a community to come together and bond over shared values or experiences on an issue. 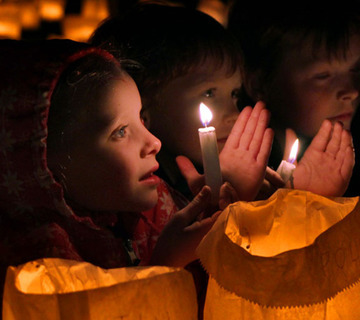 Most vigils have a particular feel to them – one of quiet respect and togetherness. They are also usually focused around emotionally striking issues. They may be candlelit, or during the day. They may be completely silent, or involve quiet and respectful music and speeches. Whatever the format of the vigil, it is important to remember that vigils are more appropriate in campaigns with an emotional side. The following photo is from a mental health campaign run in the lead up to the 2010 Federal Election. A vigil was held on the lawns of parliament house and was an important show of support for increased funding for mental health. If you are considering using this method however, like a protest or rally there are a few practical considerations that need to be taken into account. Firstly, will you need a permit or permission from council for where you plan to hold it? Will you use candles? If so, what safety precautions must you have in place? Remember to notify local police in advance of the event too. Plan how you will let people know that the event is happening: will you use fliers, posters, social media, emailing supporters, informing the local media?. After all, a vigil will only be successful if people are made aware of it! Though media landscapes are changing rapidly, local media sources are still important hubs of information. Community magazines, newspapers, radio stations, TV stations, group blogs and online forums can all be focused upon local issues and geared towards a local audience. It’s important to note though, that in order to be in the media, you have to immerse yourself in the media. Take note of what publications write about what issues. Which journalists write about your issue? – Don’t be afraid to approach media multiple times about your issue – especially when it comes to magazines, newspapers, radio stations and TV. – Let local media know when you’re about to have a big group action or petition delivery. – Target your story at media/individuals within media who you have a relationship with or you know to be concerned with reporting issues such as yours. You could also consider getting your supporters to independently contact local media with stories about interactions with your issues. Whether it be as an individual, a group of individuals, or in one coordinated effort, engaging with local media requires sustained effort, so don’t be disheartened with your first few rejections. If you are not accepted by one media source, try another. If you are continually rejected, look for times when your campaign seems more relevant. If anything, remember that local media want to talk about issues that are relevant to the community. Many institutions have meetings that allow participation from consitutents or the public. Like having a face-to-face meeting with your target, attending meetings can allow your campaign to directly engage with those who are responsible for making the changes. Depending on the make-up of the organisation, you may be able to ask questions or to vote in decision-making procedures. For example, many local governments in Australia allow residents to attend their regular meetings. As a part of a campaign to have better bike lanes in Sandy Bay, Tasmania, campaigners encouraged their supporters to attend a particular council meeting. This gave the supporters a chance to make their presence felt to councillors at a time when a particularly important motion was being considered. When thinking about the formal democratic process in Australia, it is important to remember that many avenues exist for contribution to decision processes. As a part of many of the decisions made by governmental bodies, and many of the reports prepared by non-governmental organisations, community input is sought out and collated. With this in mind, certain campaigns may benefit from contributing to relevant reports being prepared and decisions being considered. For example, the Federal Department of Environment opened a submissions process into draft boundaries for marine parks in Australia’s South West. Local groups and individuals from the coastline in question wrote in with stories of their experiences with the ocean in their area. It was an important offset to the many submissions from fishing groups and mining companies. Community campaigns are made more effective by the amount of support they have behind them. This support may come from many different areas, whether that be individuals within the community, sporting groups, peak bodies, committees, research groups, organisations, companies or many other networks of people. When gathering support, consider contacting groups that have some connection to your issue and seeking their support. The endorsement of external organisations will provide you with a whole new network of people to draw from for coordinated actions (ask the group to share your campaign around). If your issue is complicated, partnering with an organisation that works on the issue might allow for sharing of research/information to back up your campaign. If you find yourself in the position where politicians just don’t seem to be listening your emails or calls, why not consider holding a town hall forum? These are an open forum-style event to which you can invite members of the general public, organisations, experts, politicians and any others involved with the issue you are campaigning about, as well as most importantly the targets of your campaign. They provide a platform for information sharing and allow open discussion to flow in a neutral environment where people can have their say on both sides of the issue at hand, whether positive or negative. You can utilise various methods of presentation within the forum; anything from PowerPoint presentations and speeches to more creative means such as poetry, songs and videos. It’s completely up to you how you choose to engage those within the audience and what will be ultimately most effective in communicating the message of your campaign. For example, many communities in areas impacted by coal seam gas mining across Australia have come together over the last couple of years and organised town hall forums to inform their neighbours about the issue. They invite experts, campaigners and representatives of governments, and allow attendees the opportunity to ask questions. When planning tactics, make sure you consider what kinds of things your target is reponsive to. Who is your target accountable to? What do they have a stake in? Try to aim your tactics around those pressure points. Also think about the trajectory of your campaign. Your supporters may not immediately turn out to a rally, but you may like to ask them to contact their MP first. The list above is in no way exhaustive. If you’ve seen any great tactics used (or used them youself!) that you’d like included, let us know at info@communityrun.org if you’d like to discuss your ideas. P.S. Here’s a list of some of the non-violent actions others have been using recently which you could use as a source of inspiration, it’s from the Albert Einstein Institution in Boston, Massachusetts: download pdf here. Remember, don’t be afraid to be creative. Your innovation will provide the greatest rewards! « Communicating with supporters: What happens after I send an email?